May has flown by just as April did, and the tail-end seems to be full of lots of happenings, all at once. I have a story of disastrous curiosity still to tell (here's a hint- it ended in a poopy mess), because it happened on a day in which other news dwarfed it in significance: my mother's birthday, my grandfather's passing. What has followed since has been unexpected travel and the resulting extra dose of exhaustion. As a result, not only is my poop story still simmering on the back burner, I never got a chance to make a note of Mia's eight-week milestone, or comment on her newest developments. Now, here we are, on the second monthiversary of her birth, and once again I have too much content to share, and not enough time or space to do so. It's the last day of the long Memorial Day weekend, and Tom insisted on hosting a cook-out (since that's what people do on Memorial Day, after all). With such beautiful weather predicted, how could I argue? Besides, we'd yet to memorialize my mother's near-forgotten birthday, so I wanted to work that into the festivities. 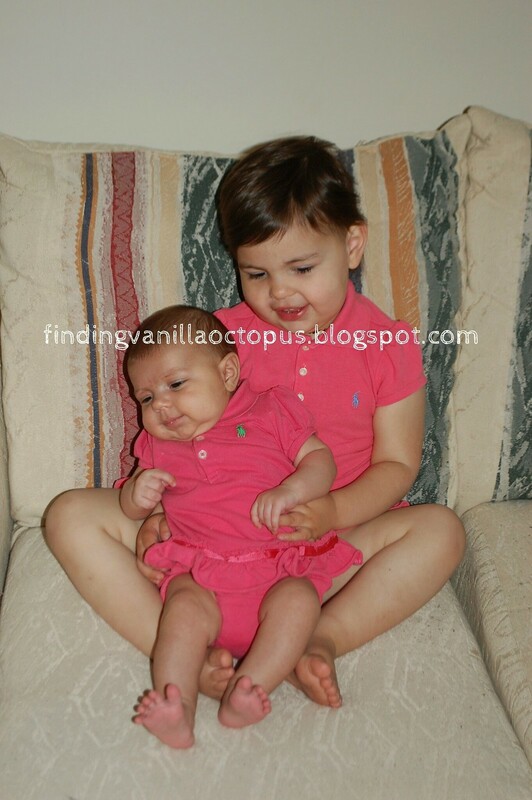 As I got the children ready for the day, it occurred to me that today would be the perfect day to finally dress the girls in their near-matching polo dresses. In the spirit of continuity, I went ahead and found polo shirt for Michael, too (though he got his own, unique color to wear). It wasn't until I'd had my fun taking pictures of the bunch of them, and indeed, sat down to upload said photos that I noticed the date on my computer. 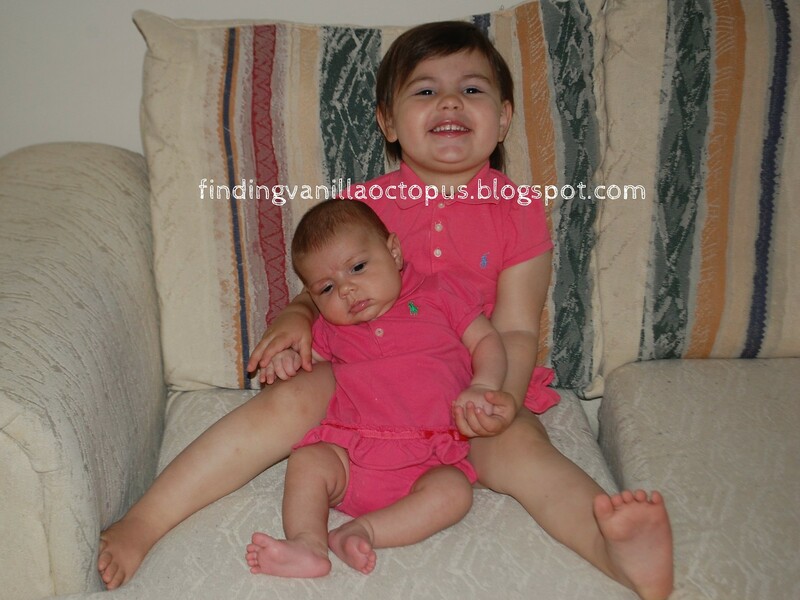 Despite my urge to drop everything and take more pictures, Mia looked far too cute to change, matching her sister as she did, into the outfit I had set aside for the Two-Month pics. Beyond that, I didn't really think it fair (or remotely likely to be successful) should I subject her to more picture-taking so soon after the morning's round, and I knew that I wouldn't have time in the evening. Therefore, I'll be attempting Mia's "month" pictures another day, and working in a post about what she's up to now along with them. It's my hope that that day will be tomorrow, but I've learned not to make such grandiose plans anymore. As for the other goings-on of today, I feel a bit strange working on a post now, before the fun has even begun, and guaranteeing myself even more of a backlog of stories that need telling. However, if there's one thing I've learned since Mia was born, it's that I need to take advantage of potential blogging time when and where I can, or it will end up happening far less often than I'd like. So, to get to the real point of this post- the sharing of the hurriedly-taken, just barely-achieved pictures of the munchkins. I couldn't even get them to look at me (well, Mia sort of did), as Abby was far too preoccupied with her sister, and Michael with the empty sippy cup that we handed him to halt his constant motion, playing into his predictable inclination to inspect the novel gift. With kids their age, if they're sitting still and not screaming, you've just got to shoot and hope for the best, so I did. ... and a grimace out of Michael. That was it for Michael, but the girls were thankfully willing to play along just a bit more. In fact, though Mia's interest gradually waned, Abby's excitement only increased over time. She loves her sister dearly, and truly cherished the one-on-one time with her, I'm sure. I find it so amazing to watch them together, not least because the love that they share touches my heart so. Perhaps I'm just seeing what I want to see, but the resemblance seems uncanny, as well. I feel as though I'm glimpsing Abby twice, in two very different stages at once. Though Abby was a bit chubbier at the same age, and had much more impressively-sized cheeks, it still seems to me as though I've got a mini version of her on my hands. 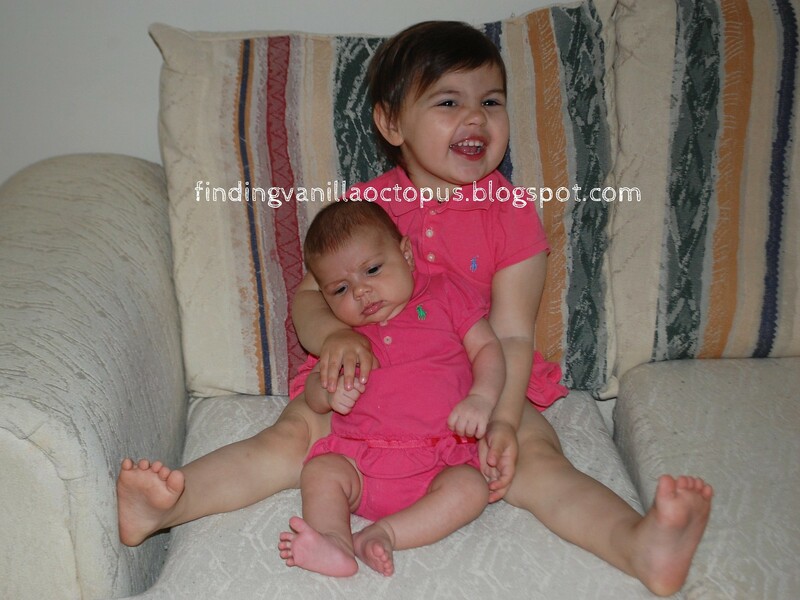 It will be interesting to see how much similarity is retained as they get older. 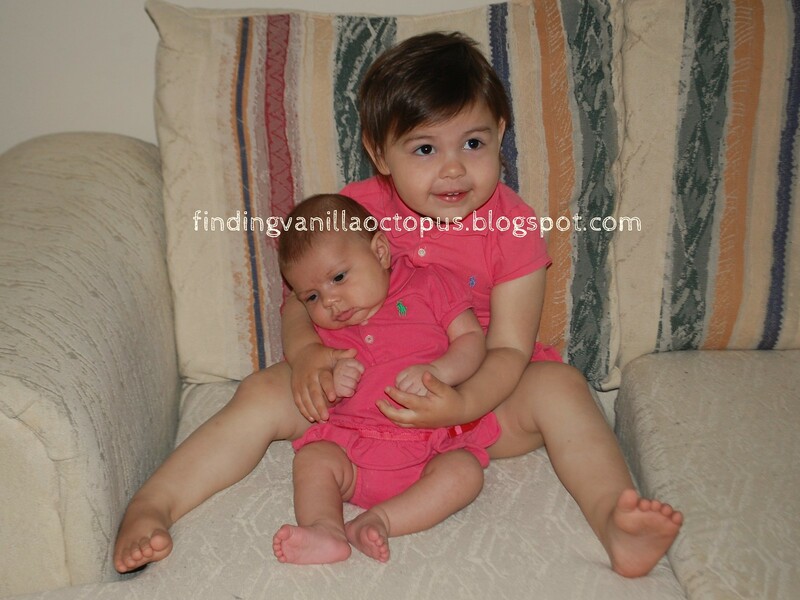 Regardless, I can't deny that they make quite a pair- my two girls- matching dresses or no.